After reading Margaret Cheney's Man Out of Time I thought the definitive biography of Tesla had finally been written — until I read Tad Wise's biographical fiction, which is a tad wiser and more insightful. 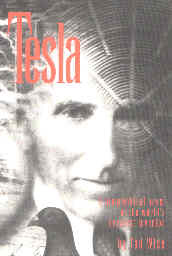 In this novel we see Tesla in his Hungarian beginnings building a blade-less turbine. We track with him as he discovered his natural penchant for poker, attended college, and sailed to the United States, letter of introduction to Thomas Edison in hand. Writhing and wincing under Edison's heavy-handed tyranny, Tesla finally stalked out of Edison's life when Edison refused to keep an agreement for payment for a large job. Into the trenches we follow Tesla as he worked digging ditches and foundations. There he met a fellow countryman, Ziggy, who became his right-hand man after Tesla started the Tesla Power Company. We are dazzled by the driven genius of Tesla — his working 20 hours a day — recharging himself with his own enslaved genie, electricity, in order to keep going. We accompany the wizard of lightning into his laboratory where blazing two-story high bolts of naked lightning slashed around and through their master. He once even overloaded the public electric power plant and burned up their generator. To demonstrate his powerful electric ray, Tesla sent a telegram to the first North Pole explorer, Commander Perry, instructing him to look for a sign while he was on his expedition. Tesla fired off an enormous bolt of energy in the direction of the North Pole and waited for word from Perry. Nothing came. Weeks later Ziggy brought in a stack of newspapers that carried the story of a hundred thousand acres of forest that were wiped out in the northern Russian wilderness, the catastrophe in Tunguska. Official explanation: a meteorite landed, only no fragments were ever found. Tesla could tell the handiwork of his genie and knew how it happened. Tesla usually dined at Delmonico's in his private dining room and exited the back door to avoid the public, and the proud fathers with maiden daughters looking for a husband. He returned to Europe in triumph, starring on the lecture stage in Paris. In London the Royal Society wanted a private lecture, but he demurred. The LRS invited him to their quarters and served him a 100-year-old bottle of Scotch that had belonged to Michael Faraday. They invited Tesla to sit in Faraday's chair, unused since the great man himself had last sat in it. These were just the kind of gestures that would melt the resolve of the famous inventor. He quickly added a lecture to the Royal Society to his schedule. Through Wise's book, we watch Tesla handle ball lightning with his hands (something no one else has ever done before or since), we watch him produce the first X-ray of a hand, we witness the first wireless telegraphy, and we know we are in the presence of genius.